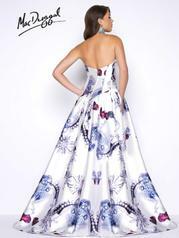 Strapless sweetheart neckline Mikado column dress with diamond and gemstone print. This dress includes an over skirt and pockets! The sweetheart neckline is embellished with colored crystal stones.